HostClick Review 2019: Is HostClick a Good Hosting? HostClick markets itself as leader in cloud hosting services. Established in 2004, the company provides hosting services to businesses of all sizes in Argentina. The vendor offers, among other hosting services, dedicated servers, virtual servers, colocation services, email marketing, and cloud hosting solutions. HostClick is a web hosting company based in Argentina. 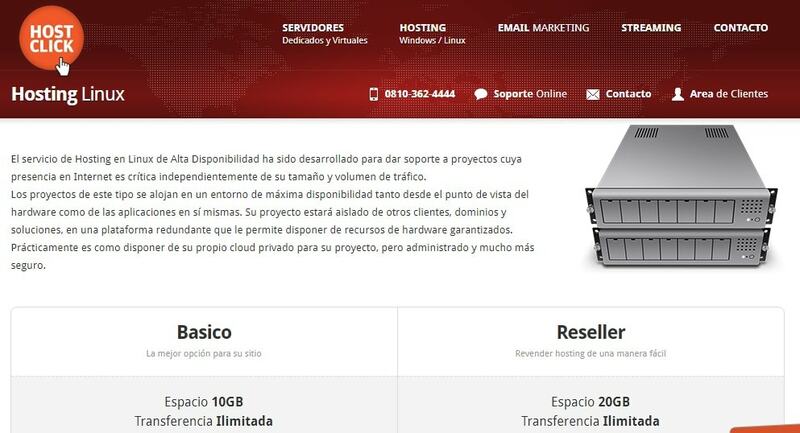 Founded in 2004, this vendor aims to integrate modern technologies in the hosting industry to meet the specific needs of its clients in Argentina and the world over. The hosting firm has a data center located in Miami from which it offers shared web hosting, dedicated servers, and VPS solutions. 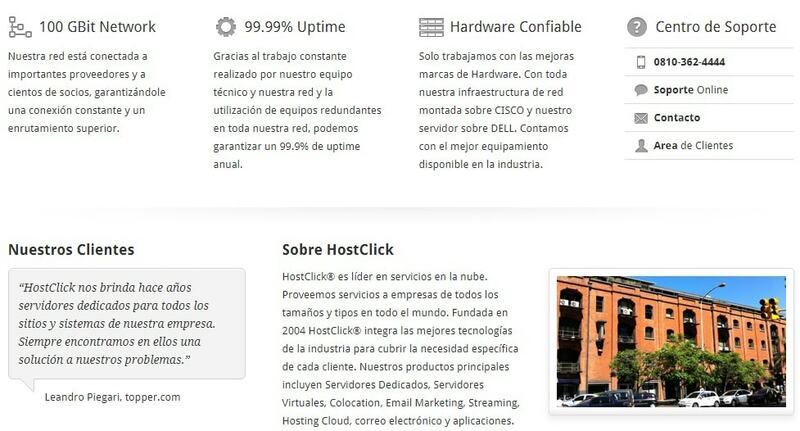 The HostClick website is only available in Spanish. HostClick services are provided from its neutral U.S. data center with 10 Gbps connections. Its servers are powered by industry leading DELL servers. In addition, the vendor offers reliable hardware components with all network infrastructure mounted on Cisco, all but guaranteeing a constant connection and superior routing. HostClick allows customers to choose either Windows or Linux operating system. This vendor’s shared web hosting solution is divided into two packages: Windows hosting and Linux hosting. The Windows basic plan is best suited for SMEs and comes with 100GB disk space and one domain name. On the other hand, the Linux basic plan is designed for personal blogs and comes with 10GB disk space and up to five domain names. HostClick performs weekly backups for all the websites it hosts. However, the vendor requires its clients to acknowledge that performing these backups is a risk, and therefore, the firm is not liable for the loss of their website data. Although HostClick’s website is easy to navigate, the website has a number of invalid icons and links, including all the order icons for its hosting solutions as well as some of its support links. Based on the prices available on the vendor’s website, its hosting plans are extremely expensive. Its hosting prices are listed in U.S. dollars. HostClick virtual and cloud servers come with a 30-day money-back guarantee while dedicated server solutions come with a 15-day money-back guarantee. That said, the hosting firm does not offer any refunds for domain name registration, software licenses, server administration, and remote backup. The vendor also offers a 99.99% network uptime guarantee. You can contact HostClick’s customer support team via telephone, live chat, or email. The vendor is yet to avail a ticketing system on its website. It’s technical support is not available 24/7 and takes very long, if at all, to respond to customer queries. Mine was one of those queries that received no reply. HostClick has yet to put up a knowledge base on its website either. HostClick has designed powerful and effective hosting solutions for businesses of all sizes. The vendor’s more than one and a half decades of experience has helped it learn practically everything there is to learn about hosting in Argentina. The one area that would-be customers are likely to be concerned about is the vendor’s unresponsive support. Wondering how HostClick stacks up against other Web Hosting companies? Enter any other Web Hosting company and we will give you a side-by-side comparison.